Fresh Strawberry Butter is so easy and delicious and one of my favorite things to make each spring. It tastes wonderful spread on a homemade biscuit, a toasted English muffin, or a buttery croissant. And it only requires 3 ingredients! Every Spring I load up on fresh local strawberries and I go to town making things with them. 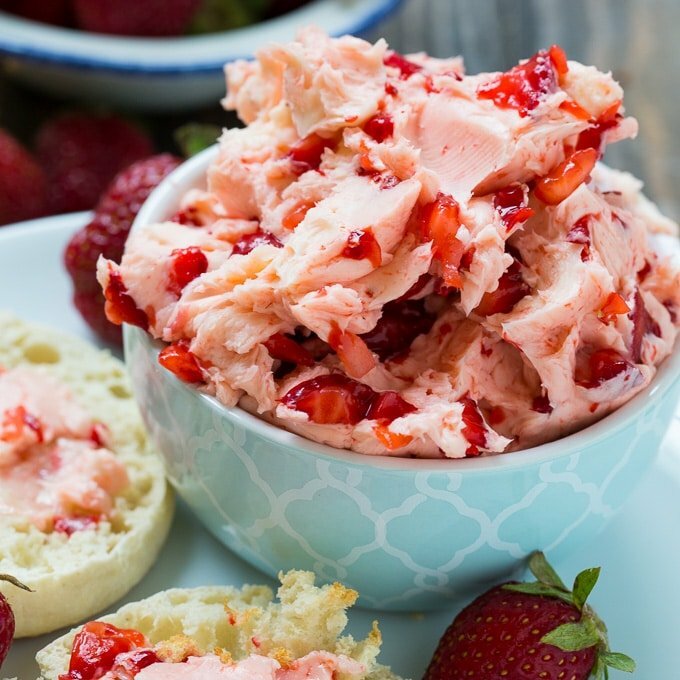 This Strawberry Butter is a favorite and I love that it can be frozen for later use. 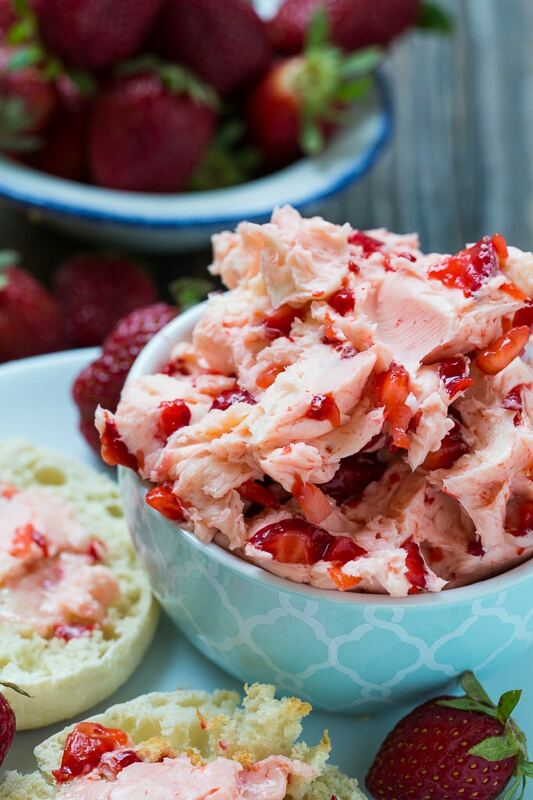 This Strawberry Butter only takes 5 minutes or less to make. You do need to soften the butter up some first. Just leave it on the counter for a good 30 minutes or so. Use a mixer, a hand-held one works fine, to beat the butter until light and fluffy. Then beat in the powdered sugar. Add some finely diced strawberries and mix just briefly to get a nice pink color. If you like your butter salty, add a pinch or two of salt. 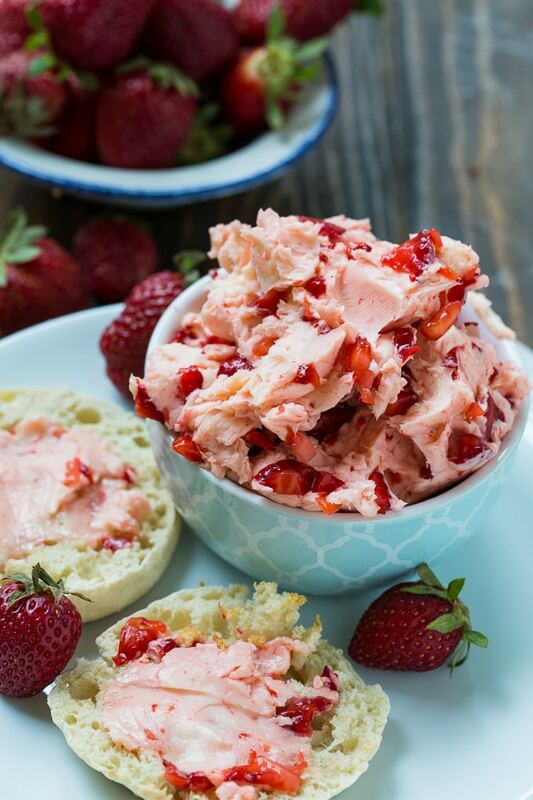 With it’s gorgeous pink color, Strawberry Butter makes a great addition to a Mother’s Day Brunch. Using a hand mixer, beat butter until light and fluffy. Mix in sugar 1 tablespoon at a time. Add strawberries and mix just until the butter becomes a pink color. If you like salty food, try adding a pinch of salt. This Old-Fashioned Strawberry Pretzel Dessert is a potluck favorite. Watch the video below to see how to make it. This entry was posted in Condiments and tagged strawberries. Bookmark the permalink. Could you use other fruits for the Strawberry butter??? ?